For hundreds of years Frederick County has been at the crossroads of American history. Today, shoppers and restaurant patrons trod the same streets as notables such as George Washington, the Marquis de Lafayette, Abraham Lincoln, Francis Scott Key, Robert E. Lee, and thousands of soldiers from the French and Indian War through the Civil War. 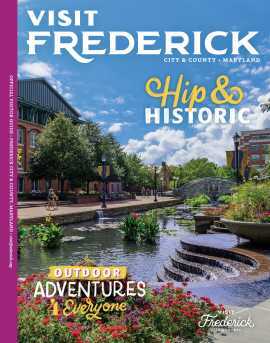 Frederick County sat on several of the major thoroughfares to the West in the formative days of the United States, including the Historic National Road, the B&O Railroad and the C&O Canal. Today museums and historic sites give visitors a sense of that important period. You can dine in an historic inn along the early turnpike, push buttons on an interactive HO scale layout of the rail line, or spend the night in a canal lock keeper’s house. Most compelling to many are the days of this nation’s greatest drama as Frederick sat on the border between North and South in the 1860’s. Monocacy National Battlefield, the National Museum of Civil War Medicine, South Mountain State Battlefield and dozens of Civil War Trails markers tell the stories not only of battles and leaders, but of ordinary citizens living here when armies invaded. Stories of compassion in the aftermath of battle help put a human face on this terrible conflict. Among those assisting the wounded were sisters from the Daughters of Charity, living the legacy of the first American born saint, who lived in northern Frederick County a half century earlier. Emmitsburg’s National Shrine of St. Elizabeth Ann Seton tells her story. Historic districts of our municipalities boast thriving Main Street communities showcasing 18th and 19th century architecture filled with unique shops, restaurants, breweries, distilleries and art galleries. Likewise, many of our local, State and National Parks exist because of an historic site around which they were developed. Historic covered bridges remain in use for automobile traffic today. They are just a few of many examples of how the past is present throughout Frederick County.